Instructors Robin Van Gyn (left) and Michelle Parker (right) listen during a presentation from the Copper ski patrol during the SAFE AS avalanche clinic on Dec. 19. 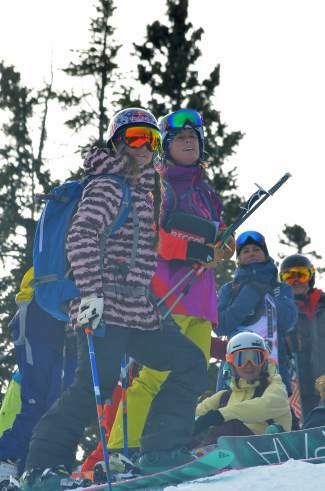 The female-only clinic drew 60 skiers and snowboarders from across the state. 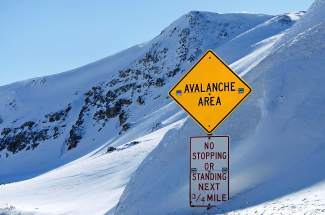 Skiers are warned of backcountry dangers via signs, terrain reports and news of recent avalanches, but often the warnings are drowned out by the lure of pristine powder. Big-mountain skier Michelle Parker of Squaw Valley (front left) watches an avy dog demonstration with ski patroler Lel Tone (front right) during the SAFE AS avalanche clinic on Dec. 19. 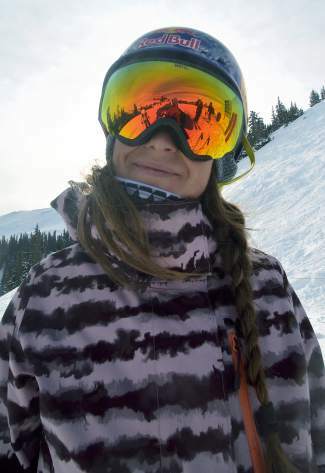 COPPER MOUNTAIN, Colo. — Michelle Parker knew she’d have almost no chance of skiing powder when she recently traveled to Colorado. On Friday, Dec. 18, the big-mountain pro left home in Tahoe and went straight to Copper Mountain for the SAFE AS avalanche clinic, a series of female-only events she hosted with a few fellow backcountry pros on Dec. 19. They touched skis to snow maybe once or twice, but it was only on groomers for the clinic — no bowls, no glades, not even a tree run. By Sunday, she and the rest were headed to the airport without a powder turn. But that was fine with Parker. Back home in Tahoe she had heard there was a storm brewing. And she had heard right. 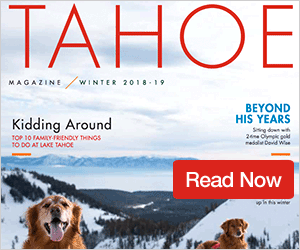 From Monday to Tuesday of last week, nearly every resort in the Lake Tahoe area saw at least two feet of snow: 36 inches at Heavenly, another 36 inches at Squaw Valley, 34 inches at Northstar. That’s how Parker’s mind works: When others are going ga-ga over fresh snow, she understands the risks will outweigh the rewards right after a huge storm. 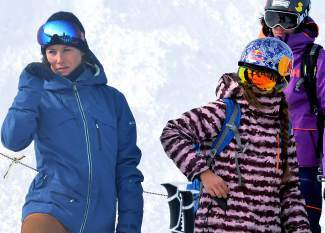 It’s a lesson she quickly learned when she left the U.S. Freeskiing slopestyle circuit in 2011 and started filming with Red Bull, Poor Boyz and Matchstick Productions. She sure as hell knows how to ski, but she also knows when not to. Now, Parker and the SAFE AS instructors are passing their knowledge to the next generation of female backcountry skiers. Before and after the clinic, the Summit Daily sports desk caught Parker on the phone to talk about Tahoe snow, beacon drills and Colorado avy safety early in the season. Summit Daily News: We have to start with snow talk: Just how good is it out there right now? Michelle Parker: It’s been really good. I’m super fired up, and we’ve been having so much fun. I’m in the Lake Tahoe area, and, after a few years of having nothing — maybe four years in a row? — we’re finally getting some snowfall. Even a month ago, I was out touring in super light snow. About three days ago, we got a solid four feet and have just been going anywhere. I’ve been blown away. It’s been staying cold out here, too, so even a few days after a storm you can go out to get turns. SDN: Good snow in December means people are already heading into the backcountry, and I think it’s a common assumption that avalanche risk isn’t as severe right now. Is that true? MP: Yeah, a lot of people think that shallow snowpack doesn’t mean there’s enough for an avalanche. But the layers can still be there in the early season, and the risk you really have right now is that it’s shallow. The top layer goes down to the ground, and, if it comes out from under your feet, you can get dragged along rocks. It’s good to get your mind in the zone now, practice and brush up on your skills early on so you’re ready when the good snow really comes. This is a great time and great place to start. 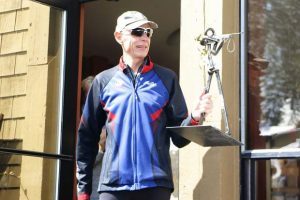 You can head out, practice your beacon drills and really practice before it gets good. SDN: What should people know about avy safety in December? MP: I’d say a little bit about what we touched on already with the shallow snowpack. Your risk is about contacting rocks and everything else. 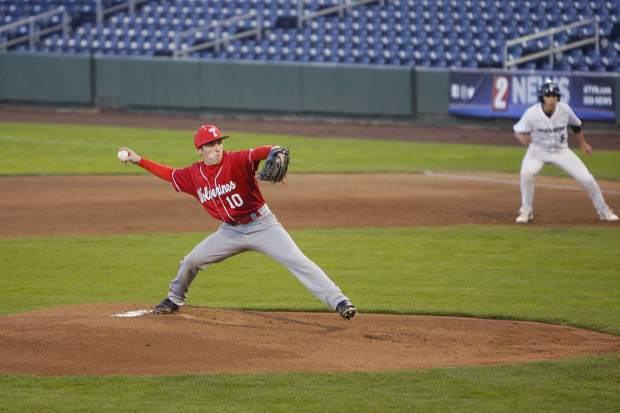 People get fired up and want to send it, but now isn’t the time. I even had a friend the other day who hit a big rock after the four feet of snow we got. It depends on where you are with the snowfall, but come December or January, that weak layer on top can be a persistent weak layer and that will come back to haunt you. It’s just a matter of getting your head wrapped around everything, taking an avy course, checking your reports, just continuing your education. 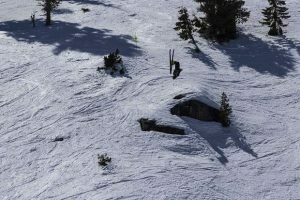 SDN: How about avy safety in Colorado? Should people do anything differently here than they would in Jackson Hole or anywhere else? MP: Avy safety is across the board the same, but the snowpack always varies depending where you are. When we come to Colorado, we do a case study with an event that happened in Colorado. That way it makes it relatable — maybe they heard it on the news or heard it from a friend of whatever. I think if you have that personal connection, then people will take it more seriously and think about it more critically, put more effort and attention into what they’re doing. SDN: The SAFE AS clinics are built by women, for women. Where did that concept come from? MP: I think we really just wanted to create a space that was encouraging for women to start their avalanche education. It’s also a good refresher course for anyone who has done this before. A lot of times, as a female, you might feel overwhelmed in an Avalanche 1 course because you’re the only girl there. We just wanted to give back to our community by creating a space that’s super encouraging. Now, you can go out with your girlfriends with your own knowledge. You aren’t just relying on a boyfriend or someone else, and if everyone knows what’s happening — knows what to look for — then everyone benefits, everyone is safer. SDN: What kind of feedback do you get from participants at the clinics? MP: It’s just a safe environment. No one is judging — it’s an awesome group. It’s hard to explain. I feel it in my own sport, too: When I go out with guys, I have a blast; but, when I’m with girls, that encouragement goes through the roof. I’m never the best when I’m out with guys, even though I have fun; but, when you go out with all women, you have the chance to really be the best. We’re in these sports that are dominated by men, and it’s easy to go out with guys all the time, but it’s always good to have a core group of like-minded women. SDN: How do you fit the SAFE AS classes fit into your schedule? I’m sure all of the instructors are busy doing what you do best — skiing and snowboarding. MP: I mean, we like to carve out a space for them. We have a whole season to focus on our professions; then comes summer and fall, we get together to work on the clinics and behind-the-scenes stuff. It’s been a very cool way for us to expand our horizons. We’re not just skiing, and I think it’s important these days to be a well-rounded individual as a sponsored athlete. You can’t just be incredible on skis. It’s very cool to have this incredible group of amazing, talented skiers come together to create what has become a business. SDN: Have the clinics and this new business made you a better backcountry skier, someone who’s more aware of what’s happening out there? MP: Yes, it’s huge to be able to teach this. It helps you learn as well. We’re all getting a refresher before heading into the season, and these clinics have really kept everything at the front of our minds. We’re also learning more about avalanche curriculum and how people are teaching about safety. I’m constantly practicing because this is something I take very seriously. My life is in my friends’ hands, and their lives are in mine, and it’s important to stay in touch with that.